Train, Learn, Connect, Create, and Lead- ALEPH’s New Lay Leadership Certificate Program Has Taken Wing! Heeding the call for more deepening spiritual practice and creative leadership in our communities, ALEPH is launching a new Lay Leadership Certificate Program (LLCP). Associate Director Rivkah Walton says, “This is a unique opportunity to deepen one’s Jewish learning and practice for oneself and one’s community – primarily to serve as a lay leader, but also as a launching platform for the ALEPH Ordination Program.” The Lay Leadership Certificate Program’s website illustrates the many paths available to graduates of LLCP, and also encourages participants to craft a course of study that reflects their own specific interests within Jewish life. Train, Learn, Connect, Create, and Lead are the five components of LLCP. As you read below, the rich variety of ways to complete LLCP will unfold. You will complete at least one of ALEPH’s retreat-based programs. Retreat-based trainings offer opportunities for concentrated focus and intensity of spiritual practice, and deep sharing with other students and retreat leaders. These popular programs include Eco-Judaism; Embodying Spirit, En-Spiriting Body; Kol Zimra Chant Leaders Training; Secrets My Grandmother Told Me: A Wisdom School; and Sage-ing Mentoring Program. A new 2-year intensive training program by ALEPH’s Institute for Contemporary Midrash is also under development. Much-loved faculty at these retreats include Rabbis Shefa Gold, Diane Elliot, Nadya Gross, Victor Gross, Shaya Isenberg, and Elisheva Brenner, along with Bahira Sugarman, Lynne Iser, and special guest faculty. Credit for qualified non-ALEPH trainings, such as the Davvenen’ Leader Training Institute (DLTI) may be transferred into the program. Through Distance Learning Courses, students will complete five foundational classes in ALEPH’s Beit Midrash. Taught by exceptional Jewish Renewal teachers, these essential courses include: Introduction to Jewish Renewal and Reb Zalman’s Thought; Jewish Spiritual Practices; Jewish Traditions of Sacred Time; Overview of the Siddur; and Introduction to Jewish Thought. A rich library of Jewish Renewal resources is available through the Beit Midrash to assist with studies. For students who are interested in honing their text-related skills or applying for any of the ALEPH Ordination Programs, elective courses in Biblical Hebrew and text study are available to support you on your path. Attending ALEPH’s biennial Kallah is an “energizing pilgrimage” which students will make as part of the LLCP. In addition to meeting Renewal Jews from all over the world, davvening together, making new friends, sharing meals, singing, kibbitzing, shmoozing, relaxing and studying together, there are also some opportunities to meet the requirements of some of the LLCP trainings at Kallah. So you can get credit for attending Kallah, and more credit toward attending one of the LLCP trainings while you are there. Two for the price of one! Imagine crafting your own individualized course of study and having an ALEPH Mentor or Advisor to guide and coach you! There are three areas in which you will work with your Mentor: Internship/Practicum, Spiritual Practice, and Capstone Project. In your Internship/Practicum, you may choose to focus on liturgical skills, text study and interpretation, social change organizing, lifecycle, or other aspects of Jewish life that may appeal to you. This is one of the most flexible and personal parts of the Lay Leadership Certificate Program. Deepening your Spiritual Practice will broaden and deepen your experience with meditation, contemplation, chanting, prayer, participating in daily and Shabbat minyans, studying texts as a meditative and insightful practice, spiritual expression through the arts, meditative motion, journaling, or spirituality-in-action — tikkun olam. As you grow within your own spiritual practice, you will also grow outwardly as a more authentic, grounded and effective as a leader in your community. For concluding the Lay Leadership Certificate Program, your Mentor, and ALEPH’s Director of Spiritual Resources will guide you in designing, completing and documenting your growth and skills in a Capstone Project. This project is an outward expression of your growth and skills, and provides benefit to your community. Examples given on the LLCP website include community, individual and personal projects – such as a social change project, guiding a young person in Bar or Bat Mitzvah study, and creating an in-depth spiritual autobiography. This list by no means exhausts the list of possibilities, and creativity is at the heart of LLCP. It is the intention of the Lay Leadership Certificate Program to empower new emerging leaders in Jewish Renewal communities. The LLCP Certificate is formal recognition of leadership skills and abilities, and responsibility to act in accordance with the “highest ideals of Jewish Leadership”, as expressed in the ALEPH Code of Ethics. 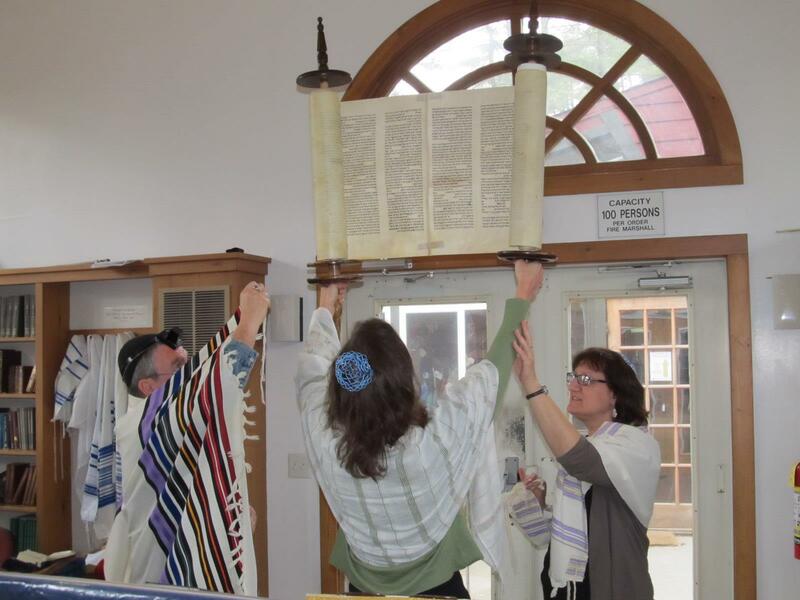 In larger communities, these new leaders may serve as assistants to their rabbis, with liturgical, teaching or ritual responsibilities. Smaller communities might offer the opportunity to serve as a primary spiritual leader. Alternatively, your passion and your vision may bring you to use your training in the arts, or in social justice work, or in any other sphere of Jewish life. However you use your training, you will be able to approach your work with a solid grounding in traditional and Renewal Jewish thought and practice, transformative skills and experience, an established mentor/advisor relationship, and a supportive network within the larger Renewal world. If you have been considering lay leadership study, Director Walton says ALEPH’s Lay Leadership Certificate Program “is both far more serious and more flexible than any other such program out there. (We did the research! )” For those who have attended Kallah in previous years, attended any of ALEPH’s trainings or taken any of its Beit Midrash courses, LLCP will “grandfather” any of these that fulfill program requirements. So trainings, classes, and retreats you have attended out of personal interest in the past can be counted towards completing your LLCP! It is ALEPH’s hope that large congregations with a rabbi who needs assistance and small communities that are unable to afford a rabbi will support interested members of their communities who wish to become certified through the Lay Leadership Certification Program. It is estimated that completing LLCP will take 2 to 4 years, and communities are encouraged to offer financial support to those committing to the program. The LLCP website has information about how to inspire donations! ALEPH’s Lay Leadership Certification Program begins this fall. Applications are being accepted immediately, and on a rolling basis. Posted in General Interest, Learning Opportunties. Bookmark the permalink.